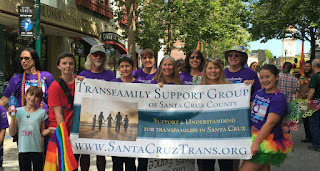 A contingent of parents and their kids from our Transfamily Support Group marched today in the annual Santa Cruz Pride parade. The audience lining the sides of Pacific Ave. were very generous with their applause, thumbs up and smiles for us. "Yeah mom" and "thank you" were common refrains. One of our parents participating for the first time with her young transgender child was close to tears as she watched her daughter's happiness and spirit grow as she waved to the cheering and applauding crowd. For myself, this was my third year marching, the first year I sobbed the whole walk because I was so overwhelmed by all the support from the audience. 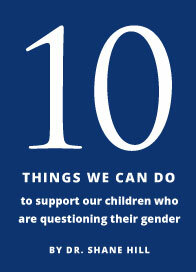 Being the parent of a gender nonconforming child is not easy. It can be scary and challenging no matter what age the child and the sheer volume of love felt astonishing. today got to experience a very affirming moment in our lives. At our booth we met other trans youth excited to pick up a brochure about our support group meetings to give to their parents who needed help accepting them. We also handed out over 200 #I'llGoWithYou buttons- which is a national campaign to alert gender nonconforming people who are in fear of using public bathrooms that the button wearer is an ally and can be asked to be nearby for safety. I saw these buttons all afternoon being worn proudly. Our booth was also visited today by an elderly trans man in a wheel chair sporting a fabulous big old beard, who said he had transitioned 25 yrs ago and he wished our family support group had been around long ago before both his parents died. I no longer cry every year as I march but I still feel the powerful love and support of our local community in Santa Cruz each year at our Pride parade.